Free download Tank Ranger game for PC. 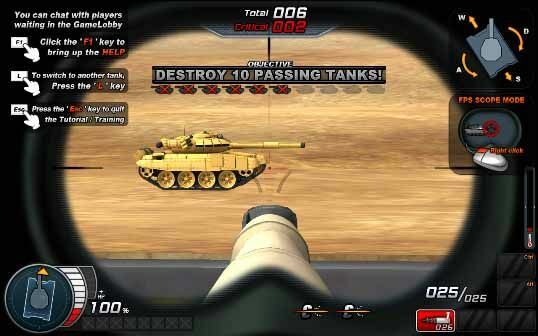 It is first person shooter game using tank in the battle. It is basically an online game which is played using internet connection. Tank Ranger is free game and you can enjoy the tank war online after installing the game into your computer. Tank Ranger game is very easy to download and install. The game setup is available within a compressed ZIP folder. When you will start the game after installation, the game patcher will check for update. After updating, you are required to enter your Login ID and password. If you are new, then you can sign up for ID. After sign up, it is required to activate your account from your email inbox. When you will sign in and start the game, there will also require NVIDIA PhysX that will be installed automatically. Now you are ready to play the game. The gameplay involves movement of tank and attacks on opponents. You can move your tank using A, W, S and D keys from keyboard. If you want to shoot a target, then you have to use left click of your mouse. You will also see the instructions on the screen during the installation. When the game starts, you have to move your tank towards the arrow point. After reaching, the arrow point will be moved to a nearby tank that is your target. You can zoom in using right click of the mouse and then shoot the tank. After that, you will see a moving tank that you have to destroy. Graphic Display: nVidia PhysX Driver is required. GeForce 4 Ti4200 64MB or ATI Radeon 8500 64MB or newer for Windows XP. For Windows Vista and 7, a GeForce FX 5200 128MB or ATI Radeon 9500 128MB or newer is needed.